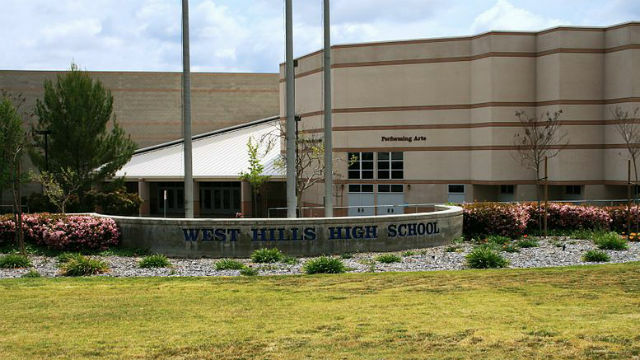 A West Hills High School student was arrested overnight by sheriff’s deputies in Santee after allegedly posting a threatening message on social media, a school spokeswoman said Wednesday. The student, whose name, age and grade were not released, was arrested “for making terrorist threats after he posted a photo of a Lego rifle on social media with a threatening message,” Grossmont Union High School District spokeswoman Catherine Martin said. No other details of the arrest were immediately released. News of the arrest came a day after a Westview High School student was arrested on suspicion of threatening to carry out a shooting Wednesday at the campus in San Diego’s Torrey Highlands neighborhood. The Westview High School student, whose name, age and gender were not released, allegedly told classmates to stay home from school Wednesday so they could avoid the purportedly planned gun rampage, according to San Diego police. Several of the students who heard the comments reported them to school officials, who called the police. That student was questioned, arrested and booked into juvenile hall, San Diego police Lt. Paul Phillips said. “No weapons have been found at this time,” Phillips said Tuesday evening, adding that the investigation was ongoing. The arrests of the West Hills and Westview high school students comes a week after two teens were arrested for allegedly making threats against Torrey Pines High School. A 14-year-old freshman at Torrey Pines was arrested Thursday, while a 16-year-old non-student was arrested Friday. All four arrests have come during a surge of threats, perceived threats and hoaxes targeting campuses across San Diego County. A similar surge in such incidents appears to be happening nationwide following the shooting two weeks ago that killed 17 people at Marjory Stoneman Douglas High School in Parkland, Florida.